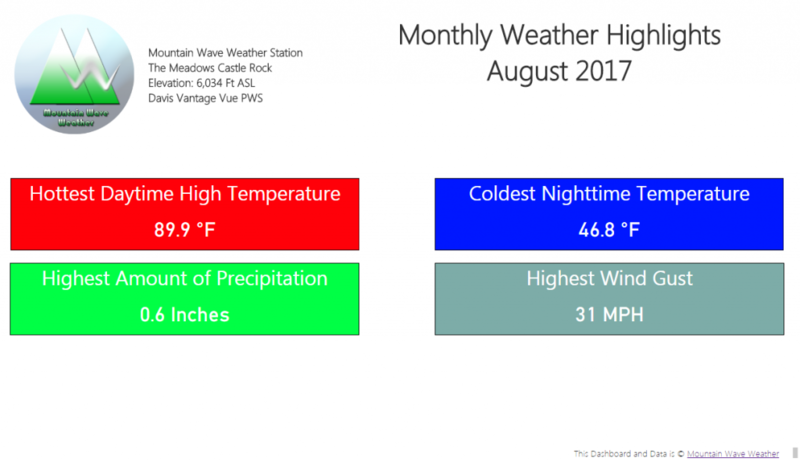 July 2017 saw the return of monsoon season in full force for some areas of Colorado while others were left high and dry! 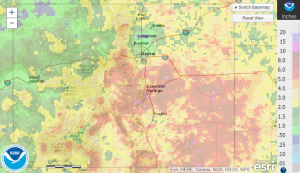 Douglas, Elbert, Jefferson and El Paso counties with other areas along the Palmer Divide saw anywhere from 2-5 inches. If you take a full snapshot of the state, the South and Southeastern bias on monsoon moisture really shows! South central and Southeastern parts of the state received the bulk of the moisture for July 2017. 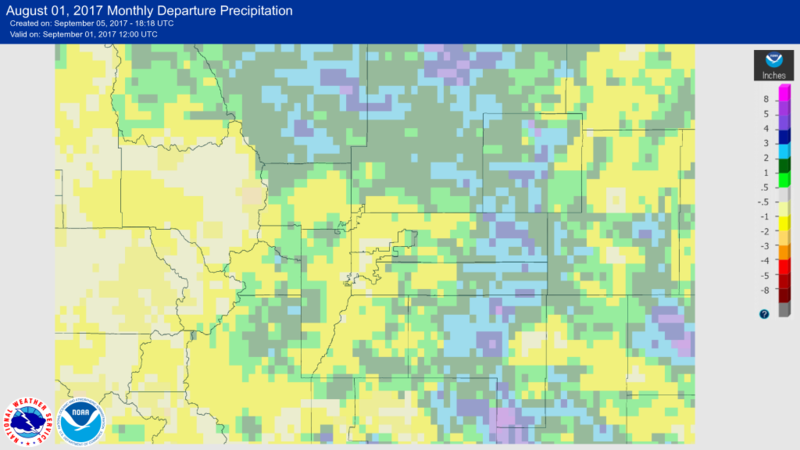 Denver International Airport only recorded 0.6 inches of precipitation for the month, meaning it is very, very dry for areas in and around Denver! 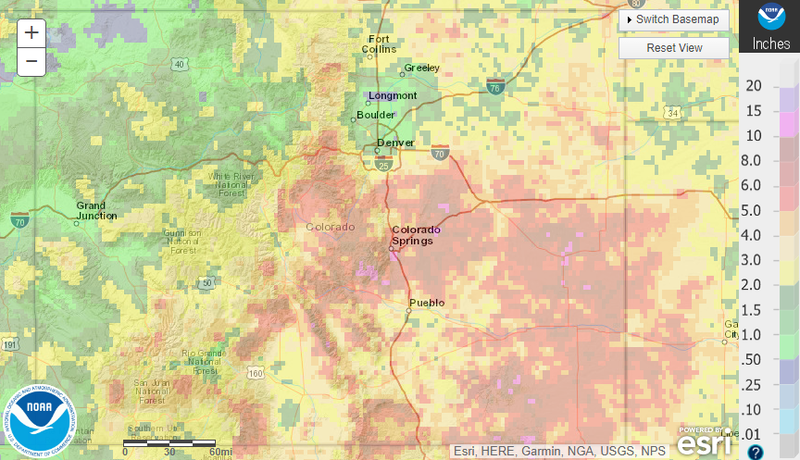 Colorado Springs on the other hand got over 6 inches of total precipitation! 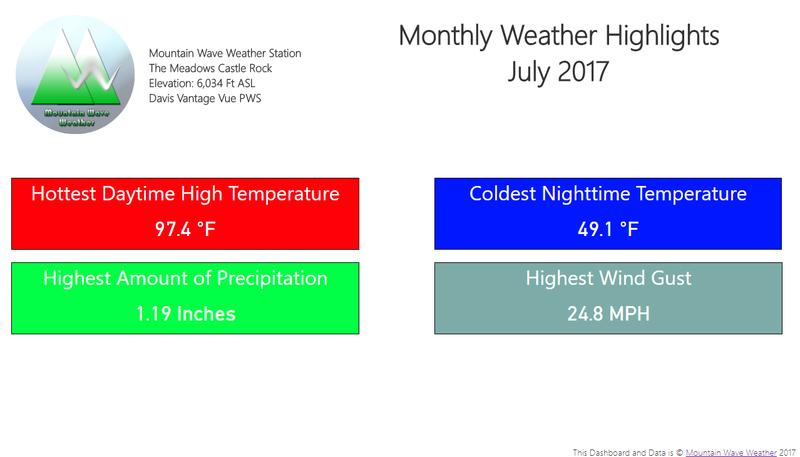 I’m trying some new graphics and displays with some new and fun ways to display my weather data this month, let me know what you think! 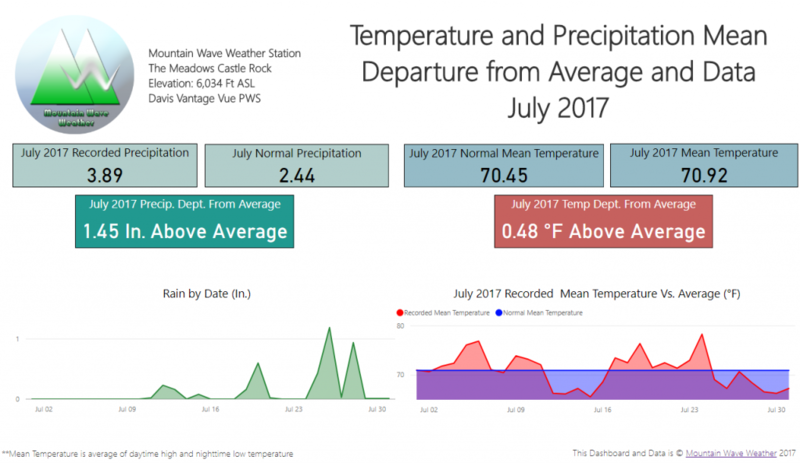 The month overall was very close to average on mean temperature… this means that the day time and night time temperatures averaged together for the month were very close to where we expected them to be with the month finishing only 0.48 degrees above average. For precipitation, the monsoon provided ample amounts of moisture to the area. 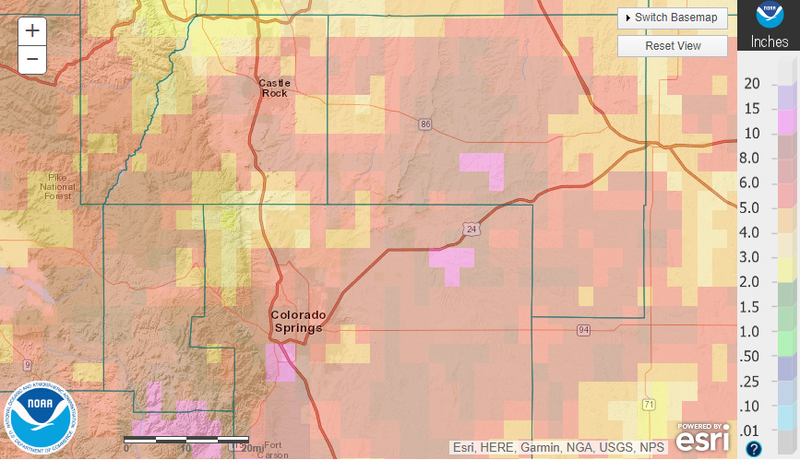 Most areas in and around Castle Rock ranged from between 2-5 inches. Some localized areas saw 5+ inches of precipitation for the month. As you can see from the graphic above, most of this came late in the second half of the month. 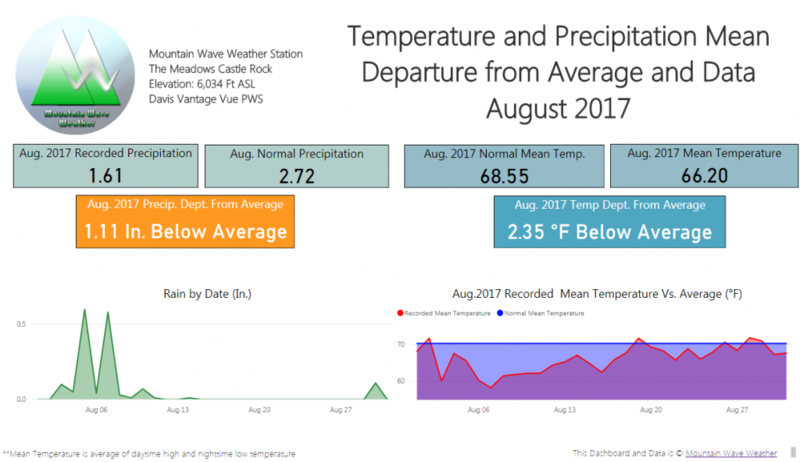 See the beta of our new Monthly Weather Tracker dashboard here! Given the current pattern I’d expect September to start off drier and warmer than normal. I fully expect the month to finish warmer than average given recent trends but would not be surprised to see the month finish close to average (only slightly above) For precipitation, I expect September to finish near normal, but keep in mind that September is a historically dry month!